Soft robots are becoming the new norm in the field of robotics. A team of engineers from Zhejiang University in Hangzhou, China, has recently developed a manta ray-inspired robotic fish with a fully integrated onboard system for power and remote control. Spanning 9.3 cm in body length (18.5 cm including the tail) and weighing only 90.3 g, the robot can swim for 3 hours on a single battery charge. 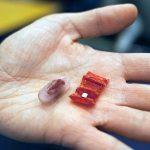 The soft robotic fish holds promise for many future applications such as operating in the complex ocean environments for monitoring water quality or discovering new ocean creatures. Conventional robots are made of rigid materials that usually limit their ability to deform and adapt their shape to the external environment. 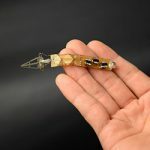 Although they have their own advantages, such as high output force, precision and controllability, these rigid robots tend to lack the multifunctional characteristics of natural organisms. Soft robots, on the other hand, are elastically deformable and capable of navigating through tight spaces without inducing internal damages. 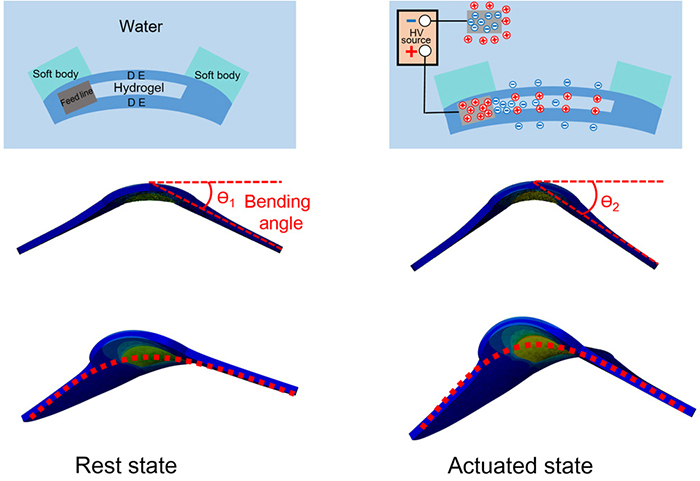 Many soft robots are powered by either rigid motors or stimuli-responsive soft actuators. The latter are more preferable, for soft robots, due to their lightweight, flexibility, and compactness. There are quite a few options of soft actuators, including shape memory alloys (SMAs), dielectric elastomers (DEs), responsive hydrogels, and living cells. 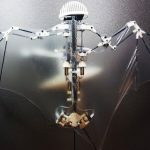 Somewhat similar to leptocephali-inspired Soft Camouflaging Hydrogel Robot which was made up of transparent hydrogels, this manta ray robot is driven by DE and ionically conductive hydrogel. DEs are known for their exceptionally fast response and large actuation, but their requirements for high voltages and thick insulations limit their use in soft-actuator based robots. To mitigate such inconvenience, the researchers decided to use the surrounding open water as the electrode for “weak yet sufficient” electric conductivity, thereby resolving the need for further insulation. 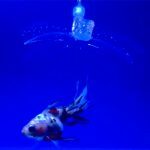 The robotic fish is composed of DE membranes for muscles, thin silicone films for fins, and silicone frame for a soft, elastomeric body. A silicone tail with an embedded electromagnet is also added for steering. Inside the DE membranes are the hydrogel that is connected to an ionically conductive electrode (feed line). When a voltage is applied to the electrode, the electric field drives the ions in the surrounding water as well as the hydrogel. Positive and negative charges accumulate on both sides of the DE membranes, as shown in the 2nd diagram of Figure 3. The positively charged edges of the hydrogel is attracted to negatively charged electrons in the water outside the DE membrane, and as those electrons attract each other they squeeze the body in between, resulting in the deformation of the DE membranes (actuation state). When the voltages is not supplied, the body returns to its original configuration (rest state). Cyclic voltage creates flapping (up and down) motions of the fins just like a swimming manta ray. 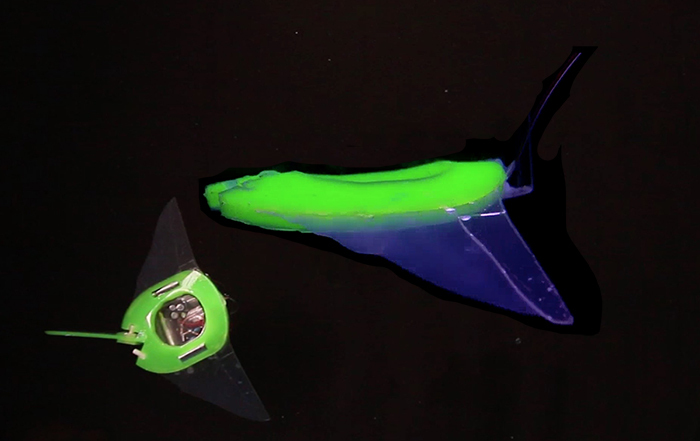 The up-and-down flapping of the fins induces undulatory motions of the soft silicone membrane, which results in the forward propulsion as shown in the video below. The thrust is generated when the robot is actuated (i.e. wired with an input AC voltage signal amplified). The swimming speed is determined by the amplitude and frequency of the applied voltage, with the maximum speed of 13.5 cm/s at 10 kV and 5 Hz. 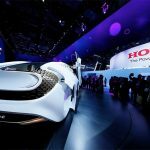 For a wireless system, the team developed an electronic pod called “Epod,” containing a high-voltage amplifier, a lithium-ion battery, and infrared (IR) remote control circuits. The Epod weighs 47.8 g and the rigid components inside the Epod are encapsulated in silicone rubber. The Epod is then glued under the fish body. 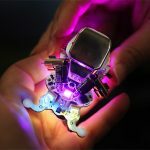 With 3.7 V 450 mAh lithium battery, the robot can swim for 3.15 hours at a speed of 1.1cm/s, and 1.5 hours at a speed of 3.1 cm/s, on a single charge. The wireless robot has a maximum forward speed of 6.4 cm/s (9.5 kV and 5 Hz). The speed reduction is mainly due to an increase in total weight (from 42.5 to 90.3 g) plus the additional drag from the Epod. In addition, the robot equipped with a video camera can make turns using remote IR control (shown in the very first video of the article). Owing to the robot’s high adaptability and agility, it can swim in can even swim in extreme temperatures (i.e. from 0.4°C to 74.2°C) without any added thermal insulation. The robot also demonstrates its remarkable disguising ability. It can easily blend into the backgrounds, making it almost invisible.